Day trip in style, with our large range of goodies to take out and about with you. The next time you’re out at a café on your mummy’s day out or you just need to take a trip to the shops, we’ve got all the gear you need. You’re going to love our 3 sprouts organiser. Made of 100% polyester, they’re the perfect size and are easy to clean. It’s never been quicker to get out of the house with all of your essentials organised and within reach. Your new stroller is completely wipeable and will have two insulated drink holders – perfect for a sippy cup, bottle or your coffee. Place your car keys or mobile in the back pocket, then close it up with Velcro. Use the main cargo area to hold tons of stuff from that kicked off shoe, discarded sun hat or favourite snack. 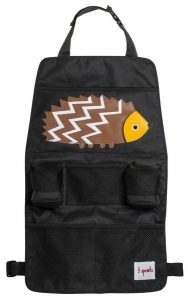 We have all kinds of themed 3 sprouts pram organisers including crocodile, rabbit, raccoon, and rhino. Then all of the accessories you need too. Dummy clips, drink bottle clips, car seat protectors, car seat gripper mats, seat organisers, travel changer change mat, placemats, and child safety wristband and phone apps. Changing your child is easy too. Buy a 3 sprouts laundry hamper and nappy bag. Don’t forget your 3 sprouts stroller organiser today, to make things easy every time you go out. Choose the themed design you and your child love the most. Now taking that walk or grabbing a coffee down the road is as simple as ABCs. No forgetting things. No digging deep to find your keys. Everything is just where you need it. Baby Vegas, your one-stop online children’s shop. Looking for something specific? Ask us.